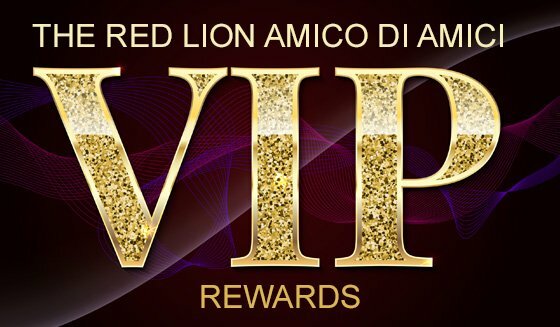 At Amico Di Amici we like to reward our regular customers. 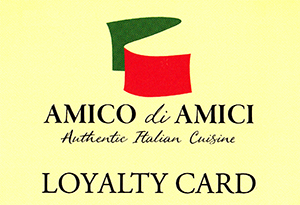 Pick up an Amico Di Amici Loyalty Card next time you dine with us and start collecting points straight away. We’ll give you one point for every £10 you spend in the restaurant. Collect 5 points for a FREE MEDIUM GLASS OF WINE, grab a FREE DESSERT OR STARTER with 10 points, celebrate with a FREE PIZZA OR PASTA when you reach 15 points and enjoy a FREE BOTTLE OF WINE with 20 points. Inform your waiter or waitress that you’re a VIP and we will get you started with 5 free stamps – that’s a complimentary glass of wine, just for joining. Reaching 100 points is some achievement! Congratulations! to Robert Sharp of Orca Pay Group - our first customer to collect 100 points. Orca Pay Group provide innovative payroll solutions for specialist businesses & contract professionals within Technology, Construction, Healthcare, Education, Industrial and Hospitality. Based in the Maltings in Stanstead Abbotts, Mr Sharp and his colleagues are regular visitors to the Red Lion Amico Di Amici for business lunches and evening meals. 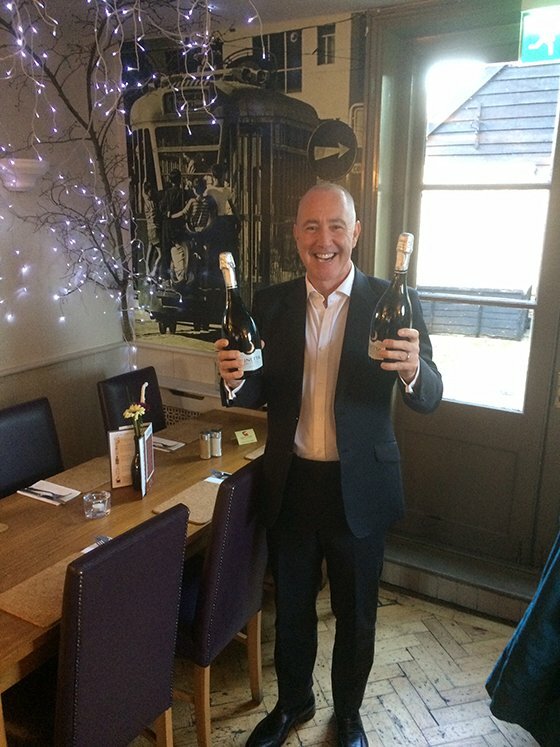 Here's his colleague Sean, collecting a case of Prosecco on his behalf. That's right, present us with 5 completed cards and go home with A CASE OF PROSECCO OR PROSECCO ROSÉ* and a place in our VIP hall of fame. Terms & Conditions apply - please see Loyalty Card for details. Cannot be used in conjunction with any other offer.